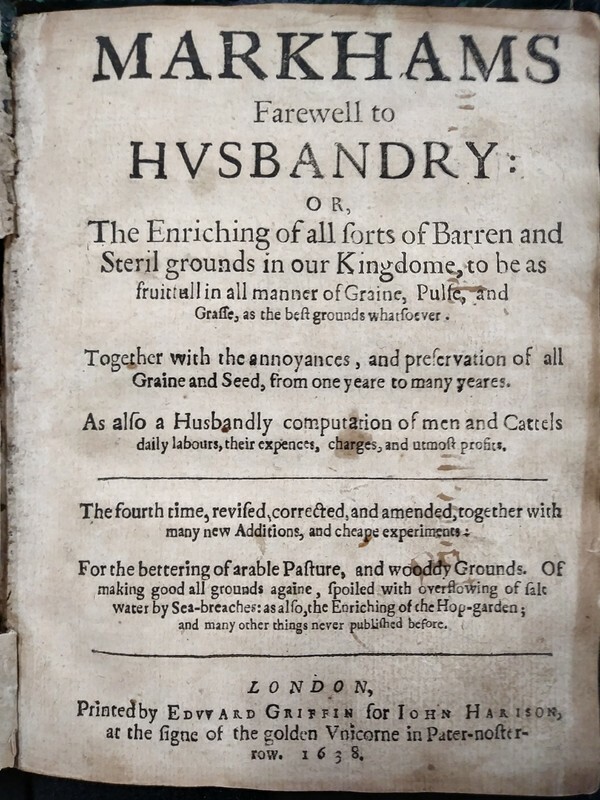 Or, The enriching of all sorts of barren and steril grounds in our kingdome, to be as fruitfull in all manner of graine, pulse, and grasse, as the best grounds whatsoever. 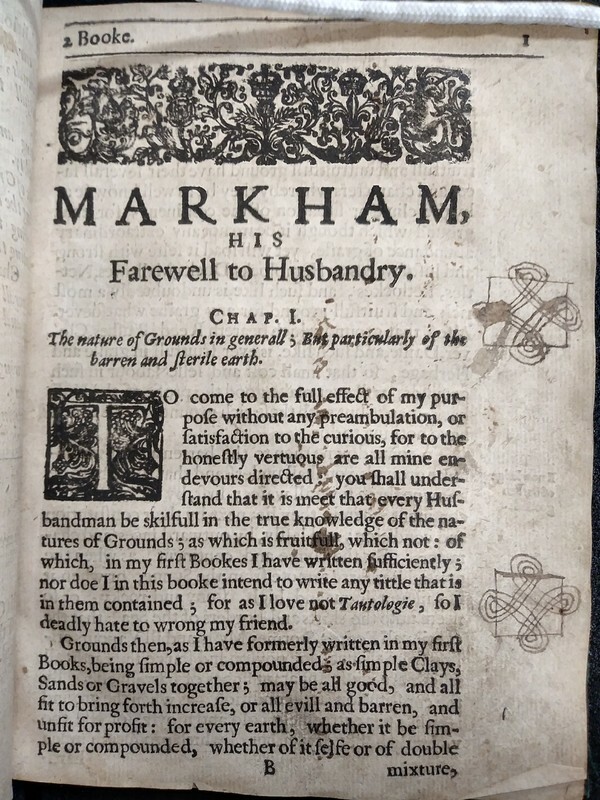 Together with the annoyances, and preservations of all graine and seed, from one yeare to many yeares. As also a husbandly computation of men and cattels daily labours, their expences, charges, and utmost profits. 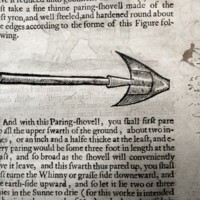 The fourth time, revised, cor., and amended, together with many new additions, and cheape experiments: for the bettering of arable pasture, and wooddy grounds. 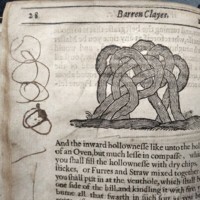 Of making good all grounds againe, spoiled with overflowing of salt water by sea-breaches: as also, the enriching of the hop-garden; and many other things never published before. 158 pages : illustrations ; 19 cm, green leather board covers. 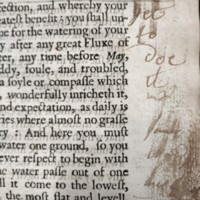 Binding and spine in rough, to very rough condition. simple leather tooling on cover, gilt edges. No binder's ticket or bookplates. 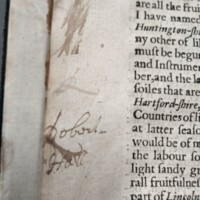 Contains frequent inscription throught, as recorded below. 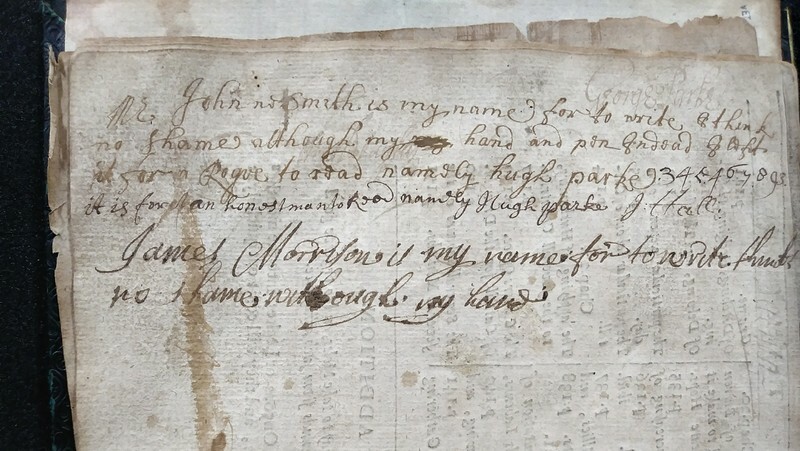 "James Morrison is my name for to write I think no shame although my hand"
"Mrs Mary Cooke her booke...[?]... 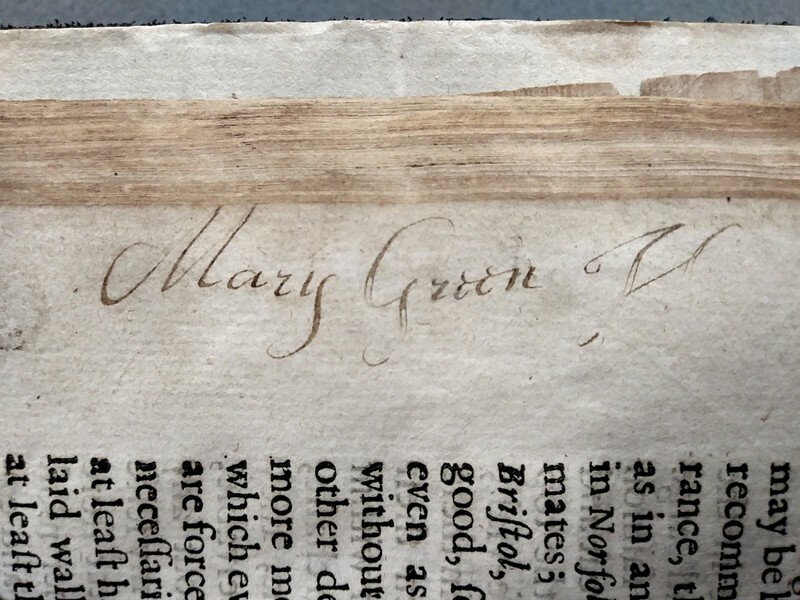 1684 given by her Dear husband"
"Mrs Mary Cooke her booke August 22"
There are many different people who felt compelled to put their name down on the pages of this book. There is an evident family connection between many of the people. 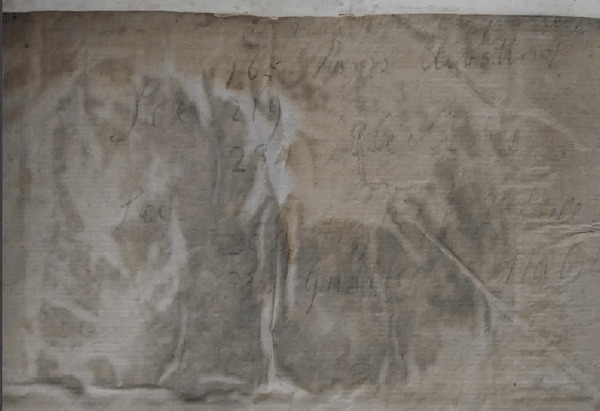 The Cooke family and the Parke family likely being related by marriage. 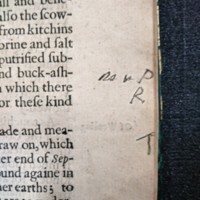 The example to the left is the lengthiest marginalia within the pages. It is very difficult to interpret this text. 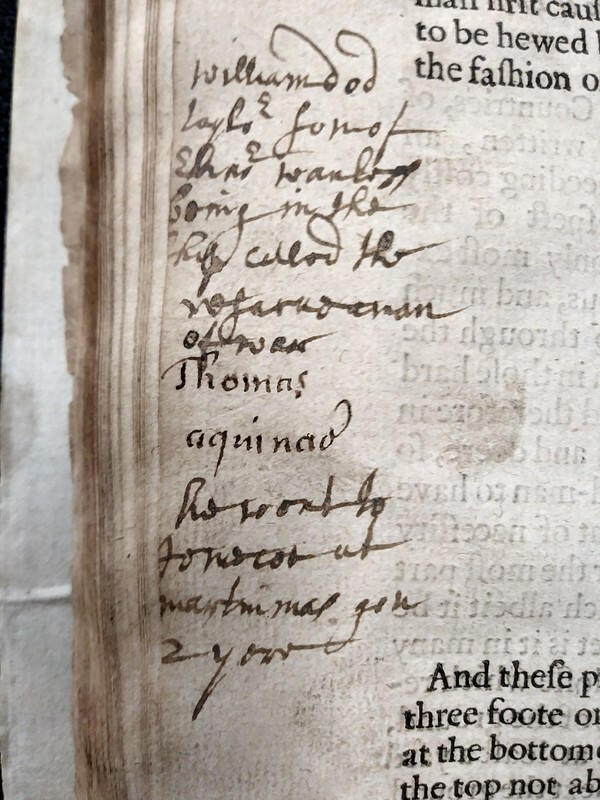 The name of Thomas Aquinas, however, is very legible. 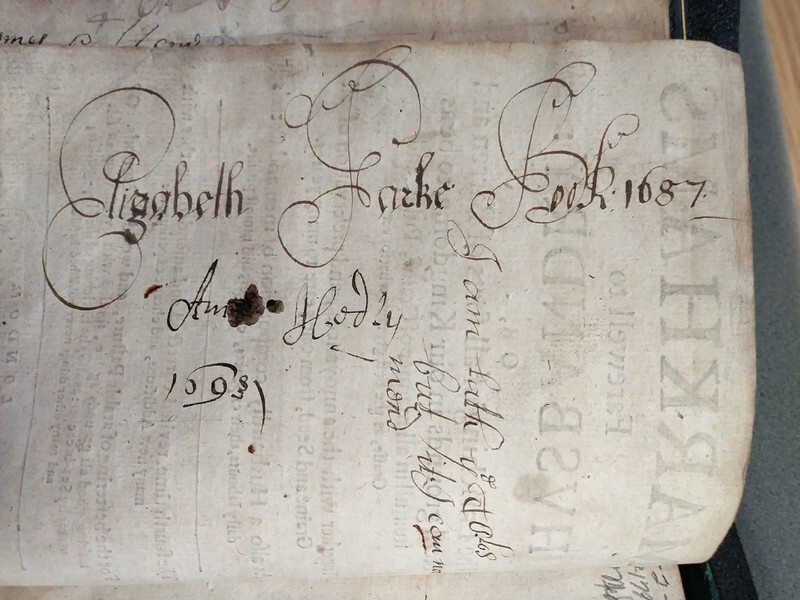 The manuscript that the name is written in appears to be written by a different hand, or was written with much more attention and care. This would make sense if the writer was describing the 11th century Catholic priest. It is unclear what context this is written in. 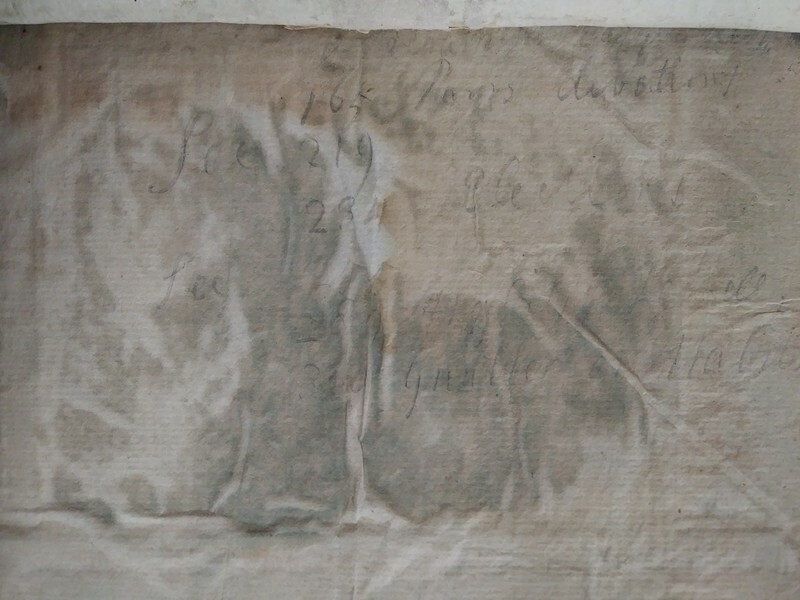 The scrawl of the script is very messy. 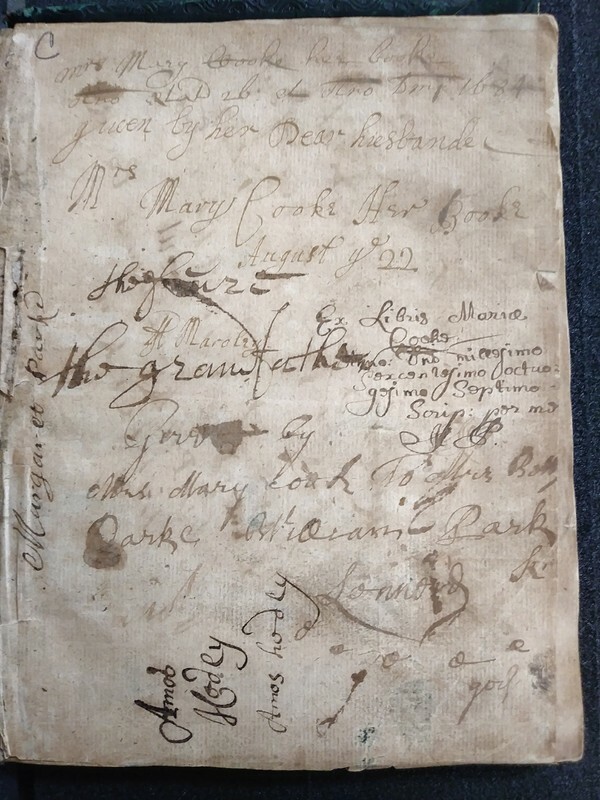 The inscriptions and marginalia throughout this book make it clear that the book has moved between many hands. 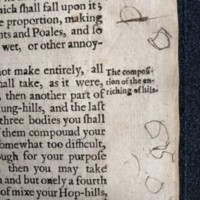 The pages have apparently fallen into the hands of children throughout the course of the book's life.